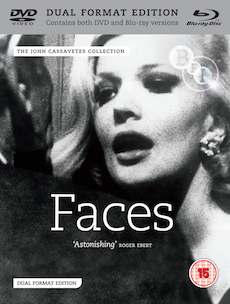 Chairman of the board, Richard (John Marley) and his wife Maria (Lynn Carlin) seek solace from their disintegrating marriage in the arms of other lovers in John Cassavetes's astonishingly powerful 1968 feature, Faces. Shot in searing high-contrast black and white 16mm, Cassavetes dissects the suffocating milieu of middle-class Los Angeles where hollow laughter and drunken frivolities mask loneliness and social alienation. Nominated for 3 Oscars – an unheard-of achievement for an independent film at the time – Faces employs a freewheeling, realistic approach, and showcases some of the finest performances ever seen in American cinema. Alternative opening sequence (DVD only, 22 min). Alternative opening sequence audio commentary by Peter Bogdanovich and Al Ruban (DVD only, 22 min).